Posted by rogerhollander in Brazil, Environment, First Nations, Latin America, Uncategorized. Roger’s note: it may be that Canada has a young hip looking (if vacuous) Prime Minister and a reputation for being more peace loving and less aggressively capitalistic than the United States, but that image is belied by Canadian mining companies in Africa and Latin America. On the banks of Brazil’s lower Xingu River, a toxic controversy looms large, threatening to heap insult upon the grievous injuries of the nearby Belo Monte hydroelectric dam. In early February, the Canadian company Belo Sun received the final operational licence for its proposed Volta Grande mine from the Pará state environmental agency (SEMA-PA). 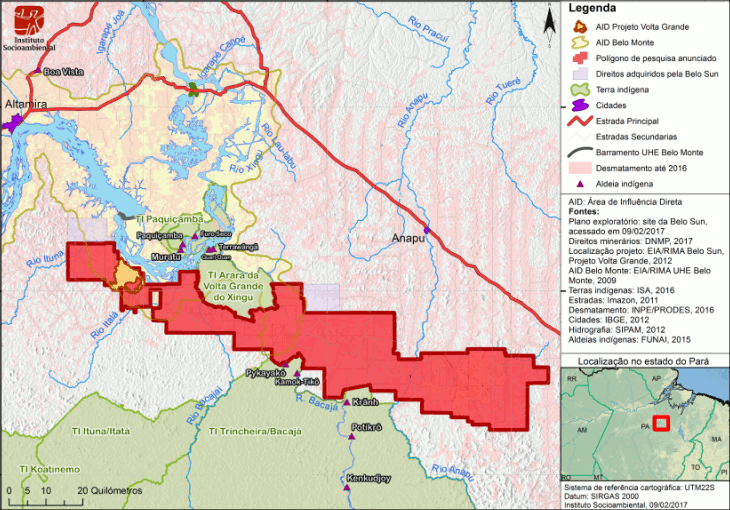 The sprawling nearly 620 square-mile concession would become Brazil’s largest open-pit gold mine, straddling the territories of three indigenous peoples and other traditional communities that are already reeling from the many social and environmental impacts of Belo Monte. Since field research for the mine began in 2008, the peoples of Xingu have publicly decried the occurrence of human and environmental rights violations in the lead-up to the mine’s construction. They have also warned of the likely negative social and environmental impacts that the mine project will cause, and recently they and their allies have taken these complaints to the courts. First, they have denounced that some of the land on which the mine will be constructed was purchased illegally, given that it is land that the federal government designated for agrarian reform in the 1980s. Second, the mine is close to the village of Ressaca, a community of 300 families, all of whom would be displaced and have not been relocated by the company as required. Third, local communities fear that the project may well end in a tragedy, like the Samarco Mariana dam collapse in 2015, given that Belo Sun intends to use a mining waste storage dam similar to the one used in Samarco. And even if the mine did not suffer a major catastrophe, the environmental and health impacts of the liberal application of cyanide, arsenic, and other toxic chemicals frequently employed in gold mining would lead to dire implications for communities already dealing with the dramatic changesto their way of life caused by the Belo Monte dam. The ruling gave the company 180 days to develop a plan to reallocate impacted communities. The company insists that it will appeal the decision. Such concerns were front and center at a March 21st public hearing in the city of Altamira, where Belo Monte’s affected communities aired their grievances to a panel of government and corporate representatives, including from Belo Sun. After attending the hearing, local analysts described the companies’ neglect of the affected communities as an intentional tactic meant to give them no recourse but to accept meager resettlement plans far from the river and their traditional livelihoods. FUNAI representatives reiterated that their office does not recognize the mine’s original environmental impact studies and demanded that a new, more rigorous, analysis be conducted that respects the communities’ right to Free, Prior and Informed Consent. To address these irregularities, FUNAI filed a lawsuit against Belo Sun in February charging that its installation license was issued by completely ignoring the indigenous agency and its demands that the project’s impact assessment and licensing adhere to a specific study of its impacts on nearby indigenous communities. That case is currently pending. At the close of the contentious hearing, public prosecutor Humberto Alcântara Ferreira Lima raised serious concerns about the true size and scope of the Volta Grande mine. He revealed a major discrepancy between the mine’s projected gold production as reflected in the license granted by SEMA-PA (pending resolution of Judge da Silva’s injunction) and what the company is telling its investors it will extract. Licensed on the basis of a 2012 estimate that the project will yield roughly 37.7 million tons of gold, Belo Sun has separately touted different projection numbers to its investors: 88.1 million tons in 2013 and most recently 116 tons in February of this year. One thing is clear: Belo Sun’s mega-mine is shrouded in irregularities and incalculable risk, much like its neighbor, the Belo Monte dam. Like Belo Sun, local communities and allies warned of the serious environmental and social impacts of Belo Monte, and, unfortunately, those dire warnings have proved prescient. And also like Belo Monte, the corporate interests behind the mine demonstrate neither concern nor prudence, rushing instead to initiate operations at any cost. Belo Sun is owned by Canada’s Forbes & Manhattan, a private merchant bank. Canadian mining giant Agnico Eagle Mines is the company’s largest shareholder, with a 19% ownership of Belo Sun. Known for its notorious Malartic urban gold mine in Quebec, Agnico is subject to no fewer than 4,000 violations of environmental laws and regulations and is subject to a CAD $70 million lawsuit for its impacts on local residents. The struggle to preserve what is left of the lower Xingu’s environment and communities from another catastrophic mega-project is not over. Even as political and economic forces line up behind Belo Sun and the region’s untapped riches, the local communities and their allies prepare to resist them. Amazon Watch has been standing with the communities of the Xingu for many years, and we will we not give up our support for them now! Posted by rogerhollander in El Salvador, Environment, Latin America, Water. For miners, investors, and artisans, few things are more precious than gold. But for human life itself, nothing is more precious than water. Just ask the people of El Salvador. Nearly 30 years ago, the Wisconsin-based Commerce Group Corp purchased a gold mine near the San Sebastian River in El Salvador and contaminated the water. Now, according to Lita Trejo, a native Salvadoran and school worker in Washington, DC, the once clear river is orange. The people who drink from the arsenic-polluted river, she says, are suffering from kidney failure and other diseases. 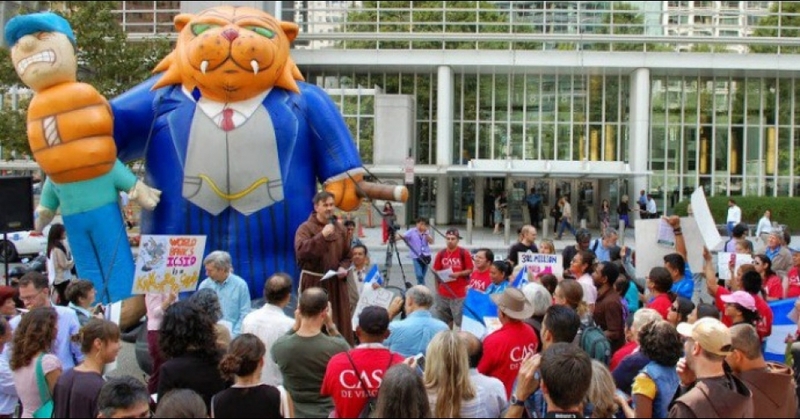 On September 15, Trejo and more than 200 protestors—including Salvadoran immigrants, Catholic priests, trade unionists, and environmentalists—gathered in front of the World Bank to support El Salvador’s right to keep its largest river from suffering the same fate as the San Sebastian River. The event was co-sponsored by a raft of organizations, including the Institute for Policy Studies, Oxfam America, the AFL-CIO, the Teamsters, Friends of the Earth, the Sierra Club, and the Council of Canadians, among others. Over the past few weeks, similar protests have taken place in El Salvador, Canada, and Australia. Mining for gold is not nearly so neat and clean as the harmless panning many Americans learned about as kids. Speakers pointed out that gold mining firms use the toxic chemical cyanide to separate gold from the surrounding rock, which then leaches into the water and the soil. And they use large quantities of water in the mining process—a major problem for El Salvador in particular, which has been described as “the most water-stressed country in Central America.” Confronted by a massive anti-mining movement in the country, three successive Salvadoran administrations have refused to approve new gold mining operations. That’s where the story should end. But it’s far from over. El Salvador is now defending its decision to prevent Oceana Gold/Pacific Rim from operating the “El Dorado” mine near the Lempa River before the International Center for Settlement of Investment Disputes, a little-known World Bank-based tribunal. As several protesters pointed out, El Salvador’s decision is grounded in its need to protect its limited water supply. More than 90 percent of the surface water supply in El Salvador is already contaminated, and more than 50 percent of the country’s 6.3 million people depend on the Lempa River watershed for their water. Francisco Ramirez, a Salvadoran who grew up in Cabañas, the region where the El Dorado mine would operate, spoke from experience about this reality. “If you look at the contaminated rivers in El Salvador, there are no fish left in the water. Not even toads, which are usually resistant to certain levels of contamination, can survive. We do not want that contamination to spread,” Ramirez proclaimed. Another Salvadorian immigrant and organizer with Casa de Virginia, Lindolfo Carballo, linked this lawsuit to larger struggles over sovereignty and immigrant rights. “This country created institutions to legally rob its Southern neighbor,” he said, referring to the “free-trade” provisions that permit corporations to sue governments over public safety regulations they don’t like. “And after they rob us of our natural resources, after they contaminate our water and land, they tell us that we are undocumented, that we are ‘illegals,’ and that we have no right to be in this country. They have no right to throw us out of the United States if they are robbing us of the resources we need to survive in our own country,” he alleged. John Cavanagh, Director of the Institute for Policy Studies, explained the goal of the protest: “We are saying to OceanaGold: ‘Drop the suit. Go home.’ To the World Bank, we say: ‘Evict this unjust tribunal. It deepens poverty and stomps on democracy and basic rights.’” Cavanagh pledged to continue pressing the company to back down, promising that protesters would return to the World Bank in larger numbers when the tribunal makes its ruling in 2015. Diana Anahi Torres-Valverde is the New Mexico Fellow at the Institute for Policy Studiesin Washington, DC. Posted by rogerhollander in Canada, Environment, Guatemala, Human Rights, Latin America, Mining. In a crackdown on mining protests, Guatemala declared a 30-day “state of siege” on Thursday in four areas of the country, suspending people’s constitutional rights and sending in hundreds of police officers and thousands of soldiers following weeks of violence. Guatemalan President Otto Perez [Molina] announced the move in an effort to quell protests targeting the mine belonging to Canadian miner Tahoe Resources Inc. Two people have been killed in the demonstrations. The company’s security guards shot and wounded six demonstrators on Saturday, said Mauricio Lopez, Guatemala’s security minister. The next day, protesters, who say the Escobal silver mine near the town of San Rafael Las Flores will contaminate local water supplies, kidnapped 23 police officers, Lopez said. One police officer and a demonstrator were killed in a shootout on Monday when police went to free the hostages, said Lopez. The government said on Thursday it was outlawing gatherings in the towns of Jalapa and Mataquescuinlta, and the areas of Casillas and San Rafael Las Flores. A decree allows them temporarily to make detentions, conduct searches and question suspects outside the normal legal framework. Protesters say the Escobal silver mine, owned by Canadian-based Tahoe and located near San Rafael las Flores, threatens their water supply. Perez Molina has been been under fire from human rights defenders for being “directly involved in the systematic use of torture and acts of genocide during the long civil war in Guatemala—as an ‘intellectual author’ and as a ‘material author. '” And last month, during the trial for U.S.-backed, School of the Americas-trained Efrain Rios Montt, a former soldier testified that “soldiers, on orders from Major ‘Tito Arias’, better known as Otto Pérez Molina … co-ordinated the burning and looting, in order to later execute people” during Guatemala’s dirty wars of the 1980s. Posted by rogerhollander in Canada, Ecuador, Energy, Environment, First Nations, Latin America, Mining. Ecuadorian officials want to sell gold-laden land to China, but not without a fight from the legendary Shuar tribe. Of the thousands of “Avatar” screenings held during the film’s record global release wave, none tethered the animated allegory to reality like a rainy day matinee in Quito, Ecuador. It was late January 2010 when a non-governmental organization bused Indian chiefs from the Ecuadorean Amazon to a multiplex in the capital. The surprise decampment of the tribal congress triggered a smattering of cheers, but mostly drew stares of apprehension from urban Ecuadoreans who attribute a legendary savagery to their indigenous compatriots, whose violent land disputes in the jungle are as alien as events on “Avatar’s” Pandora. Three years after “Avatar’s” Quito premiere, declarations of martial readiness are multiplying and gaining volume throughout the tribal territories of Ecuador’s mountainous southeast. The warnings bare sharpest teeth in the Shuar country of the Cordillera del Condor, the rain forest mountain range targeted by President Rafael Correa for the introduction of mega-mining. In recent years, the quickening arrival of drills and trenchers from China and Canada has provoked a militant resistance that unites the local indigenous and campesino populations. The stakes declared and the violence endured by this battle-scarred coalition is little-known even in Ecuador, where Correa has made muscular use of state security forces in arresting activists and intimidating journalists who threaten his image as an ecologically minded man-of-the-people. This repression has only intensified in the run-up to Correa’s expected reelection on Feb. 17. My guide to this simmering “Avatar” in the Amazon was a 57-year-old Shuar chief named Domingo Ankuash. Like many elder Shuar, Ankuash does not appear to be blustering when he says he will die defending his ancestral lands in the province of Morona-Santiago, which borders Peru. Early in my month traveling the Condor, he took me deep into the country for which he is prepared to lay down his life. After a steep two hours’ hike from his village, we arrived at a forest clearing of densely packed earth. Through the trees and hanging vines, a 40-foot waterfall replenished a deep rock-strewn lagoon. The cascade is one of thousands in the Condor cordillera, a rolling buffer between the cliffs of the eastern Andes and the continental flatness of the Amazon basin. To help him grab these shiny metals, Correa has invited foreign mining firms to deforest and drill much of the country’s remaining pristine forests. Not far from where Ankuash and I are sitting, a Chinese joint venture led by the China Railway Corp. is building infrastructure for an open-sky copper mine with the “Lord of the Rings”-sounding name of Mirador. To the north and east of the Chinese concession, the Canadian gold giant Kinross is prepping its 39 lots, including the envy of the industry, Fruta del Norte, believed to be Latin America’s largest deposit of high-grade gold. These projects are merely the first wave; others wait in the wings. Together they threaten more than the Shuar way of life and the sustainable agricultural and tourist economies of Ecuador’s southern provinces. The Condor is a hot spot of singular ecological wealth and a major source of water for the wider Amazon watershed to the east. What happens there is of global consequence. But there’s no international outcry on the horizon to concern Rafael Correa and his commercial partners abroad. What they face is a local security problem. It is the same security problem known to regional colonial powers dating back to the Inca. As Correa has always known, and as the Chinese are learning, the Condor is ancestral home to 8,000 Shuar, the most storied warrior tribe in the annals of colonialism in the New World. The most famous case of Shuar “insolence” occurred in 1599, when the Spanish governor of Maca demanded a gold tax from local Indians to fund a celebration of the coronation of Philip III. The night before the tax was due, Shuar armies slaughtered every adult male in the Spanish hamlets and surrounded the governor’s home. They tied the governor to his bed and used a bone to push freshly melted gold down his throat, laughing and demanding to know if he had finally sated his thirst. According to the Jesuit priest and historian Juan de Velasco, the “the horrendous catastrophe” at Maca caused “insolences and destructions” by the “barbaric nations” up and down the Andean spine of New Spain. For the next 250 years, the Spanish mostly stayed away. Occasional attempts by Jesuit missionaries to reestablish contact were met with a welcome basket of skulls pulled from the shrunken heads of gold-hungry Spaniards. If James Cameron’s fictional Na’vi of “Avatar” reflect the essence and predicament of one real-world tribe, it’s the Shuar. While they do not expect an action-hero savior to fall from the sky, they recognize that avoiding further bloodshed and protecting the Condor ultimately depends on getting the attention of the wider world, and quickly. The Condor’s ecological riches are a consequence of unusual wetness. The mountains of the Condor sit on massive aquifers containing a fair chunk of the continent’s fresh water. This water trickles out of innumerable crevices and pours forth from countless cascades. The streams feed famous rains. The volume of rain produced in the Condor’s water cycle is enormous, says Luna, thanks to a unique commixture of altitudes, endemic soils, and solar and wind patterns. The heavy rainwater feeds dozens of small rivers that wind east into the Rios Zamora and Santiago, which sustain the region’s agricultural economy. These eventually merge with Peru’s Marañón River, a major tributary of the continental Amazonian watershed. A group of Shuar communities next declared a “mining sweep” of their territory. They gave a Corriente subcontractor until November 1 to vacate the village of Warints, where it had set up a base. When the deadline passed, hundreds of Shuar swept into the camp from the forest side at dawn. They trapped company managers inside while the women and children used long spears of chonta wood to block rescue helicopters from landing. The mining staff was only allowed to leave the following day with their equipment. The Shuar army continued by foot to a site near the main Mirador complex, where they slipped past a military guard and took over the buildings. After a three-day standoff, all of the company’s machines were hauled away on military trucks. The state responded by militarizing the other mining camps. Throughout the area, road protests erupted that blocked mining traffic with burning tires, boulders, and bodies. The protests escalated in response to news that a massive dam and power lines were being built near Macas to provide Mirador with cheap energy. Spreading beyond rural hamlets, a general strike was called throughout the southern provinces. Rafael Correa was elected president in the weeks following the bloody bridge protest. Upon taking his oath, his left-wing PAIS Alliance fulfilled a campaign promise and convened an assembly to draft a new constitution, Ecuador’s twentieth. Burning questions of indigenous rights and environmental protection, it seemed, would be addressed democratically before the entire nation. The constituent assembly gathered in the western town of Montecristi toward the end of Correa’s first year in office and ratified 500 articles. Among them were reforms allowing the president to run for a second term and dissolve Congress. But the bits that made international news, and promised a resolution to the mining conflict in the south, was the surprise enshrining of the Indian concept of sumak kawsay, or “good living in harmony with nature.” Ecuador’s new constitution also formalized the rights of nature itself. It was with nature’s new constitutional rights in mind that the assembly temporarily suspended all mining activity until the passage of a new mining law, which the president promised soon. Correa, meanwhile, had pivoted away from the indigenous rights rhetoric of his presidential campaign. In televised speeches, he dismissed Indians as backward “donkey-riders” who were blocking access to the country’s “pot of gold.” Fatal road protests from Zamora to Quito flared back up as it became clear that Correa’s forthcoming mining and water bills would ratify and expand industrial mining and water privatization. After running clashes with police in which a Shuar schoolteacher was killed, the government attempted and failed to shut down the Shuar radio station, Arutam. The primary target for this message was and remains China. Ecuador is a serial defaulter with a radioactive credit rating, and Correa’s entire economic program is dependent on loans from China in return for wide access to its minerals. As in Venezuela and Bolivia, China has become a happy lender of last resort, offering Quito a credit line of up to $10 billion in long-term, low-interest loans collateralized with the stuff in the ground. Where Western development banks once attached strings of political, economic and regulatory reform, the China Development Bank wants the resources. Toward this end, China has become Latin America’s biggest banker with $75 billion loaned since 2005 — which is more than the World Bank, the IDB and the U.S. Export-Import Bank combined. Beijing’s top regional borrowers are Ecuador and Venezuela, where Hugo Chavez has described his nation’s oil as “at the service of China.” As of this writing, Ecuador’s debt to China approaches a quarter of its GDP. Mirador is just one of a number of recent Chinese strategic investments in Latin American mineral reserves. The firms Zijin, Minmetals and Chinalco have snatched up the largest copper mines in Chile, Peru and Mexico. But Mirador is the prize. The concession is estimated to hold up to 11 billion tons of copper, with a large secondary store of gold. Adding another layer of strategic depth to the holding, the contract includes rights to the waste rock, possibly a signal of Chinese expectations that the site contains uranium and even molybdenum, a coveted rare earth suggestive of Avatar’s unobtainium. Even before estimates had been made of Mirador’s bounty, Chinese gentlemen are said to have lurked among Zamora’s dirt-floor provincial gold markets, examining bags of rock and sand brought in by small-scale miners in rubber boots, who understood the Chinese had interests beyond their ken. Last March, Solis helped organize a 370-mile march from Zamora to Quito under the banner, “For water, for life, for the dignity of the people.” Seven thousand people walked boisterously under enormous flags of indigenous rainbows and Popular Front red. Correa’s government issued the permit request only after he organized a counter-protest to meet the marchers in Quito. In a radio address that described anti-mining Indians as tools of “the old right,” Correa mobilized his supporters against what he warned was an indigenous-led coup attempt. Amid stacks of reports in her cluttered office, I asked Solis about the upcoming election, as well as the narrowing political route open to the opposition through international forums such as the Inter-American Court of Human Rights. The hour of renewed escalation may be near. Last month, Ecuador’s indigenous organizations filed legal action in Ecuadorean courts; they are currently preparing another suit for international bodies citing conventions on indigenous consultation. Both are seen as acts of desperation, final attempts at a peaceful solution few expect. The state, meanwhile, is already spending China’s money, and developing budgets on the expectation of more to come. Other international mining firms, having been told Ecuador’s south is open for business, are lining up on the door. The government continues to exploit the promise of paradise even as it prepares to annihilate the reality. Police cars and tourism posters in Los Encuentros, the company town of Kinross Gold, display scenes of nature above the slogan “Jewel of the Amazon.” When I met with the mayor of El Pangui, a nervous little yes-man from Correa’s ruling alliance, he dutifully muttered industry lies while sitting beneath yellowing tourism posters touting the area’s pristine forests, roaring cascades, dew-kissed orchids, and smiling Indians. I spent much of my last day in Ecuador drinking coffee at a café with a good view of this Jumbotron. After a month in the south, the slick nature montage appeared to me as the billboards in dystopian science fiction, a sunny, high-tech tourism version of “War Is Peace,” or Latin versions of the electronic messages projected into the dark, rainy worlds of “Blade Runner” and “Children of Men.” I was pulled out of this reverie by the appearance on the screen of a giant pixilated toucan. With wings spread wide, the bird reminded me of the Arutam statue above the bridge in Zamora-Chinchipe. As told to me by a Shuar shaman named Julio Tiwiram, the image of Arutam and the toucan comes from a bit of tribal folklore dating to first-contact with the Conquistadors. Arutam, who lives in the rivers, the trees, the fish and the flowers, would also like to recline, Zeus-like, on a golden throne high above the mountaintop mists. One day, foreigners “with beards and large eyes” came into the area seeking food. But what they really coveted was Arutam’s golden throne. After eating their fill, the strangers searched for Arutam’s treasure. To thwart them, the spirit hid the throne deep inside the mountains. He told the Shuar to stay vigilant, that the strangers must be kept out, by force if necessary. The bearded men could not be trusted, he said. They would take everything and leave them nothing with which to live. He warned them that though he hid the gold, they would one day return. Arutam then mounted a giant toucan, looked in the direction of the Condor’s highest peak, and flew away. Alexander Zaitchik is a freelance writer in Brooklyn, NY. Posted by rogerhollander in Colombia, Cuba, Drugs, Foreign Policy, Latin America. Roger’s note: I love the photo that accompanies this article. Obama and Clinton, do they not appear to be dinosaurian? They think they are huge and powerful and indestructible, at the same time as they are on their way to extinction. The two great leaders of the Democratic Party, staunch defenders of the Monroe Doctrine in the twenty-first century, custodians of the collapsing American Empire. Our only hope is that they don’t bring the rest of the world down with them. CARTAGENA DE INDIAS, Colombia – “What matters at this summit is not what is on the official agenda,” said Uruguayan analyst Laura Gil, echoing the conventional wisdom in this Colombian port city, where the Sixth Summit of the Americas ended Sunday without a final declaration. The Fifth Summit, held in Port of Spain, the capital of Trinidad and Tobago, in 2009, had a similar outcome. At the Sixth Summit, which opened Saturday Apr. 14, the foreign ministers failed to reach prior agreement on a consensus document. Key points of discord were the continued U.S. embargo against Cuba and Argentina’s claim to sovereignty over the Falkland/Malvinas Islands, a British overseas territory in the South Atlantic. “These three issues are precisely the ones that are dividing the hemisphere in two, or confronting the countries of Latin America with the United States and Canada,” she said. “The Summit of the Americas process is in crisis. What the Sixth Summit clearly shows is that certain issues cannot be put off any longer, particularly that of Cuba,” excluded from the Americas summits due to pressure from the United States, she added. In Gil’s opinion, “there will not be another summit without Cuba. Either Cuba is included, or there will not be a summit at all. The absence of (Ecuadorean President Rafael) Correa is a red alert,” she said, referring to the Ecuadorean president’s promise not to attend any further hemispheric meetings to which Cuba is not invited. According to the expert, “Colombia positioned itself as a bridge, able to facilitate relations between contrary ideological blocs. But from this position, Colombia cannot work miracles. “This summit reminds us that ideologies are still a force to be reckoned with. The limitations are plain to be seen,” she said. The Venezuelan ambassador to the Organization of American States (OAS), Roy Chaderton – a former Venezuelan ambassador to Colombia and the U.S. – told the Colombian radio station RCN Radio: “This is a rebellion by Latin American democracies against U.S. and Canadian hegemony.”Canada and the United States were left in isolation in a vote on a resolution to put an end to Cuba’s exclusion, which was split 32 against two, at a meeting of foreign ministers that was to approve documents to be signed by the presidents. Canada and the United States were left in isolation in a vote on a resolution to put an end to Cuba’s exclusion, which was split 32 against two, at a meeting of foreign ministers that was to approve documents to be signed by the presidents. In addition to Correa, Haitian President Michel Martelly and Nicaraguan President Daniel Ortega were also absent, having sent last-minute cancellations. Ortega led a rally in Managua in solidarity with Cuba Saturday Apr. 14. On Saturday morning it was announced that Venezuelan President Hugo Chávez would not be attending the summit, due to the treatment for his cancer. At the end of the first day’s meetings, the countries of the Bolivarian Alliance for the Peoples of Our America (ALBA) released a declaration in Cartagena stating that they would not attend any further summits without the participation of Cuba. ALBA is made up of Antigua and Barbuda, Bolivia, Cuba, Dominica, Ecuador, Honduras, Nicaragua, St. Vincent and the Grenadines, and Venezuela. At the opening ceremony of the Sixth Summit, Colombian President Juan Manuel Santos did not mince words. He exhorted delegates “not to be indifferent” to the changes occurring in Cuba, which he said were ever more widely recognized and should be encouraged. “It is time to overcome the paralysis that results from ideological obstinacy and seek a basic consensus so that this process of change has a positive outcome, for the good of the Cuban people,” he said. “The isolation, the embargo, the indifference, looking the other way, have been ineffective,” Santos said. He also said that “Central America is not alone.” Organized crime must be combated, but anti-drug policy should be focused on “the victims,” including “the millions” locked up in prisons, Santos said. This summit will not find an answer to Latin America’s calls for facing up to the failure of the war on drugs, “of this I am completely certain,” he said. U.S. President Barack Obama let it be understood that his country would tolerate flexibilization of Latin American anti-drug policies, saying “I think it is entirely legitimate to have a conversation about whether the laws in place are ones that are doing more harm than good in certain places.””I know there are frustrations and that some call for legalization. For the sake of the health and safety of our citizens – all our citizens – the United States will not be going in this direction,” Obama said on Saturday. But he flatly rejected legalization. “I know there are frustrations and that some call for legalization. For the sake of the health and safety of our citizens – all our citizens – the United States will not be going in this direction,” Obama said on Saturday. Colombian expert Ricardo Vargas of Acción Andina, a local think tank, summed up the U.S. position: “‘You may decriminalize drugs, but that will not eliminate the mafias. And we will be there’,” with a military presence as soon as drug shipments cross the borders, he told IPS. From another part of the city of Cartagena, Enrique Daza, the coordinator of the Hemispheric Social Alliance, a movement of social organizations that organized the Fifth People’s Summit, held in parallel to the Summit of the Americas, announced their “satisfaction” at the same time as President Santos received a standing ovation in the auditorium where the heads of state were gathered. “They were not able to keep our demands hidden,” Daza said at the close of the counter-summit. On the positive side, the People’s Summit proposed independent integration within the region, and knowledge and respect for the contributions of indigenous people and peasant farmers to the art of “good living” and a culture of peace. The alternative summit rejected the United States’ “imposition of its agenda” at the Summits of the Americas, and demanded an end to militarization based on the pretext of the war on drugs, which in fact ends up criminalizing social protest, he said. In its final declaration, the People’s Summit castigated the United States and Canada for insisting on the promotion of free trade treaties with other countries of the continent. Canada came in for heavy criticism for fomenting a “predatory model” for the operations of its mining companies in Latin America. “The rights of investors cannot take precedence over the rights of people and of nature,” the final declaration says. The gathering of social movements, left-wing groups and human rights, indigenous, environmental and women’s organizations also launched a veiled attack on socialist governments in Latin America. While recognizing the efforts of bodies such as ALBA and the fledgling Community of Latin American and Caribbean States (CELAC), the declaration expressed that “progressive and left-wing” governments in the Americas should take steps against the extraction of natural resources and the concentration of land ownership. Posted by rogerhollander in Canada, Cuba, Energy, Environment, Latin America. Former Cuban President Fidel Castro, seen here late last month, has criticized Canadian Prime Minister Stephen Harper over “irrparable” environmental damage from Alberta’s oilsands. Roger’s note: a bill before the Canadian parliament last year that would have held Canadian mining companies accountable for crimes committed overseas was defeated, largely thanks to the Liberals. Canada may be Cuba’s leading source of tourists, an important economic partner, and one of just two countries in the region never to have broken off diplomatic ties with the island — the other is Mexico — but Fidel Castro says he doesn’t even know Stephen Harper’s name. In a column that appeared Monday in Granma, official organ of the Cuban Communist Party, the island’s former ruler says he believes the Prime Minister goes by the name Stephen Harper — but it’s hard to be sure. In other words, Stephen Who? Are we a colony, a republic, or a kingdom? According to the man with the famous beard, we apparently don’t know ourselves — and neither does he. Worst of all, however, is the human and environmental damage that Castro says is being inflicted upon many Latin American countries by rapacious Canadian mining companies. “I became really depressed when I deepened my understanding of the facts about the activities of Canadian transnational companies in Latin America,” writes Castro. He implies that Canadians, of all people, ought to know better than to exploit the natural and human resources of other countries, considering what the United States is supposedly doing to Canadians. That experience makes it all the more reprehensible, he suggests, when Canadian mining companies turn around and cause “incredible damage” to “millions of people” in the search for “gold, precious metals, and radioactive material” in Latin America. Posted by rogerhollander in Canada, Latin America, Peru. Earlier this summer, an anti-mining Indigenous movement in Peru successfully ousted a Canadian mining company from their territory. “In spite of government repression, if the people decide to bring the fight to the bitter end, it is possible to resist the pressure of mining and oil companies,” Peruvian activist and journalist Yasser Gómez told The Dominion . The David and Goliath scenario of this anti-mining uprising highlights the vast economic inequality that has beset Peru. The country’s economy has been booming for the past decade, with a seven per cent growth expected this year—one of the highest growth rates internationally. Sixty-five per cent of the country’s export income comes from the mining industry, and investors are expected to spend over $40 billion in the next 10 years on mining operations. Yet this growth has not benefited a large percentage of the population. The poverty rate in Peru is just over 31 per cent; in the countrysde, two in three people live under the poverty line. Today, there are over 200 communities organized against mining across Peru. On June 5, left-leaning presidential candidate Ollanta Humala defeated right winger Keiko Fujimori, the daughter of ex-president and human rights violator Alberto Fujimori. Humala, who won resounding support in the poor countryside, promised to redistribute wealth by increasing taxes on the lucrative mining industry. But another political force, from the grassroots, may end up being a powerful force of change under Humala. In May and June of this year, hundreds of local residents in Puno organized road blockades, strikes and protests to demand that the government rescind a concession to the Vancouver-based Bear Creek Mining Corporation. Activists also called for an end to future mining concessions in their area, due to the industry’s impact on the environment. According to Bear Creek, at the time of the protests the company had already invested some $25 million in the mine. Company Director Andrew Swarthout said the mining would not impact on Lake Titicaca (a massive fresh water lake shared by Bolivia and Peru) and would create approximately 1,000 jobs. But local residents were not convinced. Walter Aduviri is the president of the Front for the Defense of Natural Resources in Southern Puno, and a leading organizer in protests against Bear Creek and mining in general in the area. “It is as though we, the Aymaras, do not have any politicians or representatives in the congress,” Aduviri told a reporter from the Peruvian newspaper La Republica. He critiqued outgoing president Alan García, who he says governed only for those who have money. “We do not ask for money, we ask for respect for our rights, our property and territory,” said Aduviri. Indigenous campesinos on the Bolivian side of the border began road blockades in solidarity with the Peruvian activists. Overall, the blockades put a standstill to inter-country traffic, stopping hundreds of trucks, local passengers and tourists. On June 24, following seven weeks of strikes, protests, road blockades and bloody police repression of activists, then President García broke with Peruvian political tradition and heeded the demands of the protesters by cancelling the Bear Creek contract, and putting a three-year hold on future mining deals for the region. In addition, recently inaugurated Ollanta Humala has pledged to move forward on legislation that will make community input necessary before mining operations anywhere in the country can proceed. Just hours after García overturned Bear Creek’s concession, a conflict erupted at the airport in Juliaca, north of Puno. There, activists protesting other mining operations and a hydroelectric plant occupied the airport only to be attacked by police who shot and killed five protesters. Major English media outlets inaccurately reported that García’s decision against Bear Creek was linked to the massacre at the airport, when in fact the airport protest was linked to separate proposed mining and hydroelectric projects. In response to García’s decision, Bear Creek has applied for a constitutional injunction against the Peruvian government. Swarthout contends that the cancellation of the concession is unconstitutional and in violation of foreign investment laws. Moore noted that it is plausible that Bear Creek could use the Canada-Peru Free Trade Agreement, signed in 2009, to challenge the loss of their concession. The wave of strikes and conflicts that have swept across Peru in recent months, along with the election of Humala, are likely to have a long-standing impact on the regulation and taxation of the multinational extractive industry in Peru. On August 23, at the time of this writing, the Peruvian congress signed into law a bill that requires mining and oil companies to consult with Indigenous communities before constructing extractive projects. Humala now has to sign the bill into law for it go into effect. The people’s victory in Puno against Bear Creek may set the stage for a new struggle in the country that will test the political will of Humala, and challenge social movements to pressure from below. Benjamin Dangl is the author of Dancing with Dynamite: Social Movements and States in Latin America and The Price of Fire: Resource Wars and Social Movements in Bolivia (AK Press). He edits TowardFreedom.com, a progressive perspective on world events, and UpsideDownWorld.org, a website on activism and politics in Latin America. Email Bendangl(at)gmail(dot)com. Posted by rogerhollander in Ecuador, Energy, Environment, Human Rights, Latin America. On December 2, 2006, 14 paramilitaries armed with 38-caliber guns and pepper spray fired into a group of unarmed Ecuadorian campesinos from a community that has been resisting a copper mining project for over a decade. Thankfully no one was killed, but there were several injuries, not to mention the psychological suffering caused by such a vicious attack. This assault led three of the local campesinos from Intag, Ecuador to file a lawsuit against the Toronto Stock Exchange (TSX) and Copper Mesa Corporation, the Canadian mining company responsible for hiring the “security firm” that sent the paramilitaries to intimidate the anti-mining residents of the region. John McKay, a Liberal Member of Parliament from Canada, actually introduced legislation that would have been a concrete first step in holding Canadian mining companies accountable for their behavior overseas. Bill C-300 would have sanctioned the Canadian federal government to investigate human rights and environmental complaints filed against companies with the authority to cancel any governmental funding if found guilty. While some activists and NGO’s leveled criticism against the bill for being too tepid, most supported the legislation. Unfortunately the Canadian government, largely perceived to be in the pockets of the mining industry, did not and the bill was voted down. Catherine Coumans, research coordinator for MiningWatch Canada, has charged the government with “aiding and abetting” the industry’s inhumane, if not criminal, behavior. Last month, when three judges at the Court of Appeals in Canada ruled against the three Intag residents, a lot more than a lawsuit was lost. The court basically said that people overseas have no right to sue a Canadian institution or company for human rights violations in Canadian courts. Their statement to the world reaffirmed what many communities effected by Canadian mining projects in the developing world already know: institutions like the TSX and Copper Mesa will never be held accountable for human rights abuses and environmental destruction they fund and carry out. “Do Canadians really want to have their legal system on the one hand authorize Canadian mining companies to go abroad to developing countries, and then on the other hand totally absolve the directors in Canada of any responsibility whatsoever for human rights abuses those companies may perpetrate there?”asked Murray Klippenstein, legal counsel for the Ecuadorians, who is also legal counsel for a widow in Guatemala whose husband was murdered by the head of security of a Canadian mining subsidiary because of his outspoken concerns about the activities of the company. But the ruling also produces another very unsettling effect, or better put, reinforces a widely-held belief in the extractive industry resistance movements overseas: that it is a waste of time, energy and funds to try to use the judicial system in order to have their rights recognized and communities protected. The implications are troubling. One example to illustrate this point is the infamous Chevron-Texaco case where 18 long years had to pass before the 30,000 Ecuadorian indigenous and campesino plaintiffs got a favorable sentence in an Ecuadorian court for their lawsuit based on the grave health impacts from years of petroleum extraction- and contamination- in the Amazon. The destruction has been such that it’s been labeled a “Rainforest Chernobyl”. But even now the case could be held up in courts for an additional decade from appeals, meaning that many of the plaintiffs will have died before the possibility of collecting what is due them. Canadians don’t hear too much about the environmental destruction and social upheaval their oil, gas and mining industries are spreading overseas. In spite of countless reports of human rights violations all over the world, Canadian corporations have been very successful at greenwashing the news back home and replacing it by images of the “socially responsible” Canadian corporate citizen bringing wealth and development abroad. However, if the lawsuit contributed to the company being expelled from the TSX, as it was on February 2010, leads to its bankruptcy, and as a result pressures the judicial system in Canada to open itself up to legitimate lawsuits brought by communities overseas against their extractive industries, then it was very much worthwhile. If, in the long run, it will contribute to bringing about legislative reforms that will effectively reduce or stop the murders of anti-mining activists, like what happened in El Salvador and Mexico, and other human rights, social and environmental abuses, then it will have been a major victory. Much depends on how much information is able to filter through to the average Canadian, and what it will take to get them outraged to demand such changes. Added to this failing of the justice system in Canada, the same week saw the superior court in Quito throw out my (Carlos Zorrilla) lawsuit against film producers working for Ecuacorriente for criminal libel. Unfortunately, this was also no major surprise given the state of the judicial system here. I had initiated a criminal lawsuit against Chinese-owned Ecuacorriente for a 45-minute documentary film paid for by the company where they falsely linked me to anti-mining violence in the south of the country. Communities understand, not only at a gut level but also through experience, that they are politically and legally outmatched by powerful corporations with deep pockets and decades of experience thwarting justice by manipulating the court systems. Rulings such as Ramirez vs. Copper Mesa only reaffirm this belief. Therefore, many communities could read into the defeat of the lawsuit that their only practical (and affordable) solution to the threats that mining and other extractive industries pose on their rights, land and cultures lies in physically standing up to these projects – even at the risk of being labeled terrorists or saboteurs. Ramirez vs. Copper Mesa will reinforce the idea that direct, physical resistance is the only way to prevent community members from being murdered, indigenous cultures from being annihilated, and the environment from being decimated. This, at a time when special laws are being enacted in countries rich in natural resources, such as Ecuador, to judicially categorize acts of civil disobedience as terrorism. As of today, there are nearly 300 activists in Ecuador facing terrorism and sabotage charges for standing up to mining and other extractive activities that threaten the livelihood, or well-being of communities and the environment. Over half of these targeted activists are indigenous, including the leaders of the most important indigenous groups in the country. Ironically enough, this happens in the context of Ecuador’s progressive Constitution, which recognizes that nature has rights, and that Ecuadorians have the right to a good life (Sumak Kawsay). Take away the only effective tool that communities and indigenous people have to protect these rights from transnational corporations and you have the making of a major, and sustained, human rights nightmare supported by the State. This is why the court decision in Canada matters, not just in Ecuador, but throughout the world. Carlos Zorrilla is director of DECOIN, Defensa y Conservación Ecológica de Intag (Intag Defense and Environmental Conservation). Cyril Mychalejko is an editor at www.UpsideDownWorld.org. He worked as a human rights observer in solidarity with the mining resistance in Intag. Posted by rogerhollander in Canada, Foreign Policy, Honduras, Human Rights, Latin America.